Cheteswar Pujara will lend faith and reliance to brand SBI Life Insurance. The ultimate “insurance” for the Indian Test team in troubled times, Cheteswar is the perfect person to represent an insurance brand. Mr.Dependable of Indian cricket epitomises faith and reliance. The man in spite of his unmatchable traits to invoke confidence, a star in his own right, Pujara is deprived by the commercial world of sports everything his deserves in monetary terms for being his true self. However, SBI Life Insurance finds him as an able ally and shares the journey of the Pujaras – Puja and Cheteswar – in its first commercial campaign with the Test star of Indian cricket. In the 145-second video, the duo not at all public persona reveal the secrets and love on the journey together that completed six years only yesterday (Thursday). 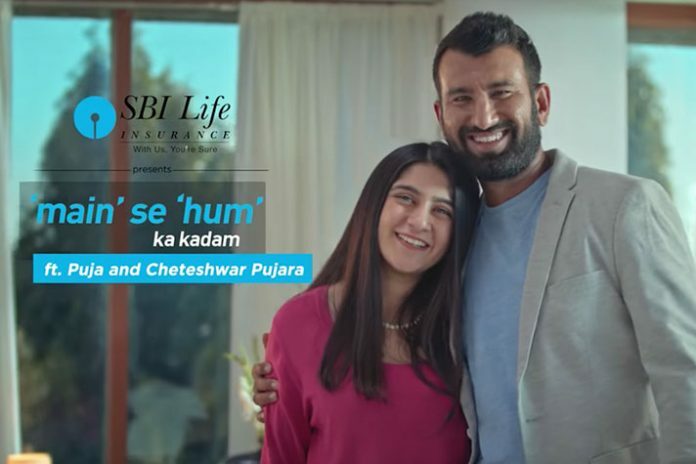 Pujara has been by SBI Life Insurance as face of the brand. His first campaign video leave as soothing an impact of millions of his fans as he does with the craft of his willow in white flannels. The ‘love story’ of the most private person of Team India is also appropriately shared on the eve of the Valentine’s Day.